A woman who claimed to have witnessed a newborn being thrown from a moving car was the baby's mother and concocted the story as a way to abandon the child and conceal her pregnancy from her family, officials said Friday. "It's not as horrible as we first thought," Sheriff Ken Jenne said. "The baby was never thrown out of a moving car. This is the case of a disturbed woman who gave birth and did not want to keep her child." No charges were brought against the woman, 38-year-old Patricia Pokriots. She was committed for psychiatric evaluation under a law that allows for people who are a threat to themselves or others to be held for 72 hours. On Thursday afternoon, Pokriots dropped an hour-old baby off at a sheriff's station, telling authorities that she had scooped the boy up after seeing him tossed out of a car onto the grass, Jenne said. Pokriots told investigators she saw a couple arguing in a car, then witnessed the woman throwing the child from the passenger side. Eventually, investigators found inconsistencies in Pokriots' story, and on Friday she acknowledged that she had lied, the sheriff said. "She has indicated that she does not want the child," Jenne said. The baby, whose umbilical cord was still attached when he was brought in, had no injuries, reports Joan Murray of CBS station WFOR-TV. "He weighs 8-pounds, 2-ounces, and I have to tell you, I saw him, he looks beautiful, he's a little fighter, full of life," Veda Coleman-Wright, of the Broward County sheriff's office, told WFOR-TV. The sheriff said the woman had kept her pregnancy a secret, and had initially planned to take the baby to authorities. 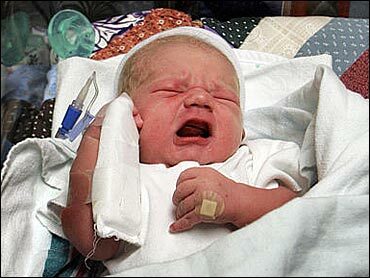 State law allows a mother to abandon a baby at any medical facility or fire station within three days of birth. But she came up with a cover story after seeing two people argue inside their car, the sheriff said. A boy who was playing nearby did see a couple arguing, but never saw them throw anything out, Jenne said. Pokriots is a barmaid and has an arrest record including an aggravated battery charge. "She said she may be a threat to herself," Jenne said. He said she has a 10-year-old child who will be taken from the home Pokriots shared with her mother.